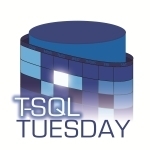 It always comes to me as a surprise that it is TSQL Tuesday again. I guess time just slips by so quickly these days. If you haven’t heard about or figured out what this Tuesday stuff is all about drop me a line and I will not only sell you on the concept I will convince you to write your first post for next month. We have Ewald Cress ( B | T ) to thank for this month’s topic. As I go about my daily life I often give thought to how I got where I am and to those who helped me get here. I try to reach out and provide support to as many folks as I can because I realize what a difference a lending hand or kind word can make in someone’s life. I find this blog post difficult to write because I don’t want anyone to feel left out and being somewhat forgetful, I may not remember that one time. So if you feel that I left you out of the important story of my life, do know that it wasn’t on purpose. First off, there was Deborah Whitten. Her team hired me in as a secretary–clerk level, actually–and she believed in me and my ability to do more. She let me do things way above my job scale, recommended me for a promotion and helped me get my first technical role as an Application Administrator. She never really planned on me doing that job; instead, I learned to be a Quality Assurance & Systems Analyst along with a bunch of other cool things over the course of 5 years. She gave me my break! Then there was this cute boy down the hall. I don’t know why I suddenly felt the need to impress him–all my life I had only been interested in older men. Maybe it was his old guy shirts or Friday ties. One day he said something like “Hey you are bored down there (my office was down the hall), why don’t you tinker with this hot new Microsoft thing called SSRS and see what you can do with it.” So I did. I was writing reports and tuning other people’s queries to make their reports run faster before you knew it. In the end, we decided to move to Nashville, TN and unfortunately, he left for a new job and it was a year before I was able to join him. At that point, I became the “closest thing to a DBA.” So it was really all his fault that I got into data. BTW I married that cute boy at PASS Summit in 2011. Denny Cherry officiated the ceremony while several #SQLFamily members watched. Once in Nashville, I was working for a not very respected company; they were known for not treating workers very well. At one point I had a CrAzY boss and one day I walked out. The DBA Dev team had an extremely quiet manager and he talked me into staying and assured me that my talents were being wasted on the current team. I didn’t think much about it at the time, but looking back he gave me a break and an opportunity to learn so much about the engine. While a lot of my time there was crummy, that experience was worth it. For a fair chunk of time, I was so hungry for knowledge, trying so hard to catch up and be good at what I was doing. I attend free training online every chance I got. Quest, back before it was bought and sold again, had great offerings. Tom LaRock (who was then SQLBatman) and SQLSentry were also monumental in my learning. Today there are several important folks that inspire me. Stacia ( B | T ) is my dearest friend who’s not afraid to set me straight and is always there to pick me up. She’s a pillar of the Business Intelligence community, and after knowing her a short time, she brought me a signed copy of her book. I cried, no I sobbed at how not worthy of her I was. Now we are partners in crime! There’s Angela ( B | T ) who is just a kind-hearted human being that is a joy to be around. I love getting little pick me up notes from her, and reminders that I am not alone. There’s also Karla ( B | T )and Allen ( B | T ), who are here to keep me grounded and I love them dearly. Some days I don’t know what I would do without them. There are @Nash_BI and @NashSQL, these communities are hard to keep up with sometimes, but every time I see a person’s face light up because they have finally “gotten” something, every success story I hear from one of them, and every time I can help one of them, it is truly refreshing in this world riddled with hate. I have my new IDERA ACE Family and I can’t tell you how excited I am to be awarded such an honor. There is a slew of women who will PM me when I post about struggles in life, they share their stories behind the scenes and that’s okay. I understand their hesitation of putting it out there for the world to see their flaws, troubles, and insecurities. But just knowing that someone else has that same thing in their life, that someone understands me is reassuring and helps me cope. These silent women are nothing short of Amazing! Don’t worry there are a few amazing guys who will also quietly chime in and I do appreciate them. I could go on for days on this subject because my #SQLFamily is so full of amazing, kind, smart and funny human beings. I am truly lucky to be blessed with such a brigade on my six.